At Gettysburg, I walked down Col. Edward P. Alexander’s massed artillery position without examining any barrels. Later, while moving out to the Peach Orchard, I looked at the topography and the importance of that position and wondered why Gen. Daniel Sickles had place troops there. Walking back to the car, I noticed the 15th New York Independent Battery, and noticed that nearby was rifled bronze cannons. This left me a bit confused, so I photographed the guns and left. 1857 Napoleon Gun near the Peach Orchard at Gettysburg, Pa.
Research later revealed that the battery was issued M1857 Light Field Artillery Pieces (nicknamed “Napoleons”), a smooth-bore gun. What followed was that I could not pass a bronze cannon without checking to see if it was rifled. There were many bronze cannons and I determined that there were four rifled-pieces that seemed to be either unidentified or incorrectly marked as “smooth-bores”. One looked like a Union 12-lb. Napoleon but with a large foresight added. Another, looked like a 6-lb. rifled artillery piece. A third appeared to be a bronze 3” Ordnance Rifle. Finally, a straight-sided cannon was also found to be rifled, but didn’t resemble any other type. What followed was a long-winded story that resulted in me not finding all the answers I wanted to. Several confused National Park rangers were not even aware of the discrepancies with these guns, even at their own sites. Jason Spellman of Richmond National Battlefield Park was the only one who could offer an answer. I can’t recall the gun he showed me in one of the books at visitor center but it explained one of the four types. As I traveled to other battlefields I carried this curiosity with me, from Manassas to Williamsburg, Fredericksburg and Chancellorsville, Cold Harbour and Five Forks. I also flew to Atlanta (Ga.) and met Gordon Jones at the Atlanta History Center, who showed me the battlefields swallowed-up by the city and then headed off to Kennesaw Mountain and Chickamauga. He greeted me at the park museum and helped answer my question about the 6-lb. 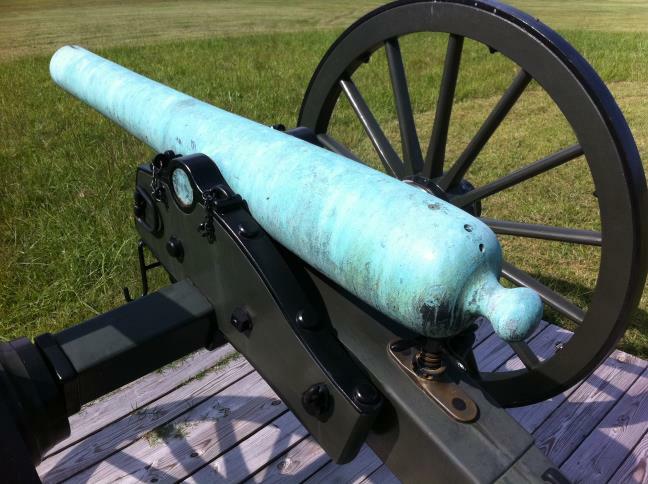 cannon, which I could get no answer for at Manassas. The ranger at Brawner’s Farm thought it might be a post-war production as it would be easier to cast a new gun rather than alter an original. The first answers came late in my Virginia travels after I accidentally got lost and crossed the James River in search of a McDonald’s to use the Wifi internet. On that side of the river, I decided to check out that Petersburg National Battlefield had to offer, which was a great choice. At their visitor centre, I found the same models of cannon as those at Gettysburg and signs describing what they actually were. 12-lb. Napoleon is most likely a 14-lb. James Rifle, or a re-bored 1857 Napoleon adapted to accept the 14-lb. James projectile. The designated name for this modified gun is not known. 6-lb. Napoleon is that very gun but re-bored to accept the 12-lb. James Rifle projectile and appears under the name of either 1841 Rifle or 12-lb. James Rifle. Straight-sided rifled gun is the Confederate version of the 3” Ordinance Rifle, designed to accept the same 3” projectile of the US ordinance rifle and 10-lb. Parrot Rifle. 3” Ordinance Rifle made of bronze is most likely the actual 14-lb. James Rifle. It has similar external appearance (possibly US army model), accepted the James Rifle projectile, and therefore has a very different configuration. This was the answer I found while researching more about re-bored guns that accepted the James projectiles. I plan to do more research when I return to the States and my findings are not the final answer on these bronze cannons. But I do hope that in the future if you see a bronze gun, that you might take the time to see if it has been rifled. My feeling is that re-boring artillery may have been a common practice during the war. Surviving artillery afterwards therefore resulted in the prevalence of noticeably re-bored pieces. And with the need for display cannons to fill the National Parks, they remain common examples of original artillery. Today, many Americans will celebrate all things Irish, unaware that, as one article discovered, “Everything You Know About St. Patrick’s Day Is Wrong.” Typically we associate the traditional holiday with drinking, more drinking, and later maybe a bit more drinking. 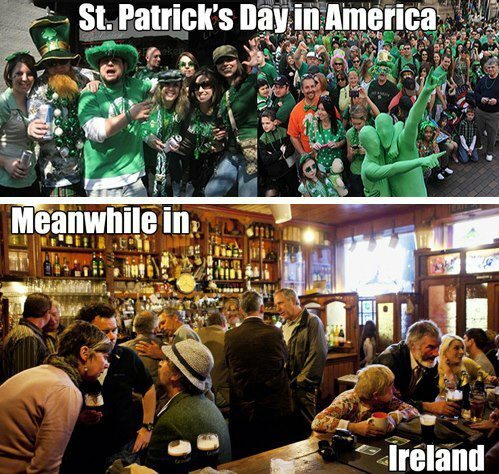 Oh, and being Irish. Our family is no exception. As a kid, I remember walking through the rooms of my grandparent’s house and discovering a small wooden plaque with our family coat-of-arms neatly painted on it, while in the other room hung a framed ancestral history. To me, those items were not just souvenirs, they are reminders of Mimi and Papa’s curiosity and desire to discover more. Both are no longer with us, but the same inquisitiveness continues today. Likely, Patrick Foley and Ellen Donovan, my twice great-grandparents. Taken at Berlin Studio on 33 Patrick St., Cork. Passed-down to my father from his mother, the day after Thanksgiving 1981. No one seemed certain who the sitters were, but the emblazoned-guilt addresses of both studios where unmistakably sharp. We decided to look them up. 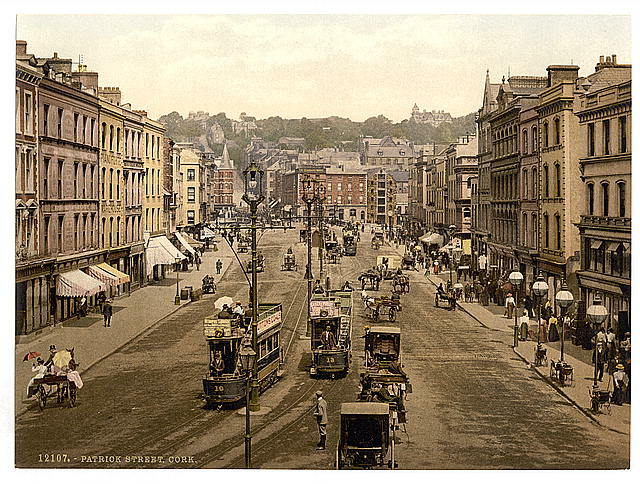 Cork had swelled into an overcrowded place by the late-Nineteenth century. Terrible poverty had swept through the countryside during the Great Famine of 1845-52, forcing rural farming communities into relocate to urban areas or face starvation. Nearly 80,000 people resided in the city, though thousands had left in search of better living conditions (namely Britain or N. America). Still, many did not leave and brought rise to several important industries, such as brewing, distilling, wool and shipbuilding. [St.] Patrick Street, Cork. County Cork, Ireland. Amidst the din of commerce on St. Patrick’s Street (sometimes just referred to as “Patrick Street”), one of the main roads through Cork, were two far quieter settings. Francis Guy, a stationer and photographer, ran one photographic studio at No. 70, while his collaborator Richard Williamson & Co. occupied a second, later known as Berlin Photographic Studio. City directory listing for both photographic studios in 1884. 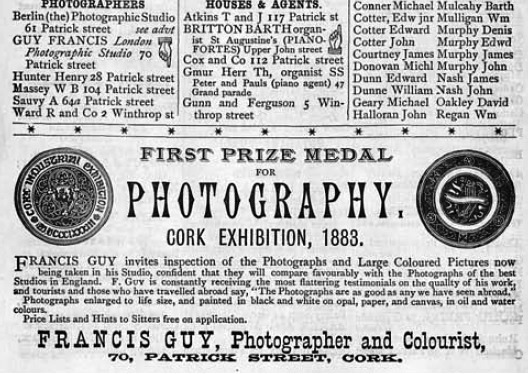 Note the larger advertisement for Guy’s Cork Exhibition the year prior. Early records show that the Guy family initially operated a grocery store on Patrick Street in 1842. They learned the craft of paper-making which later was mastered by Francis Guy and turned into a full-time trade. Those same processes were introduced into the field of photography, whereby Guy became well-known for enlarging prints and setting them onto portrait cardboard. “It is no unmerited praise to say that nothing superior to them could be produced in the best lithographic establishments in the kingdom,” the Cork Herald reviewed in 1884. He continued publishing, printing, and photographing for over forty years. 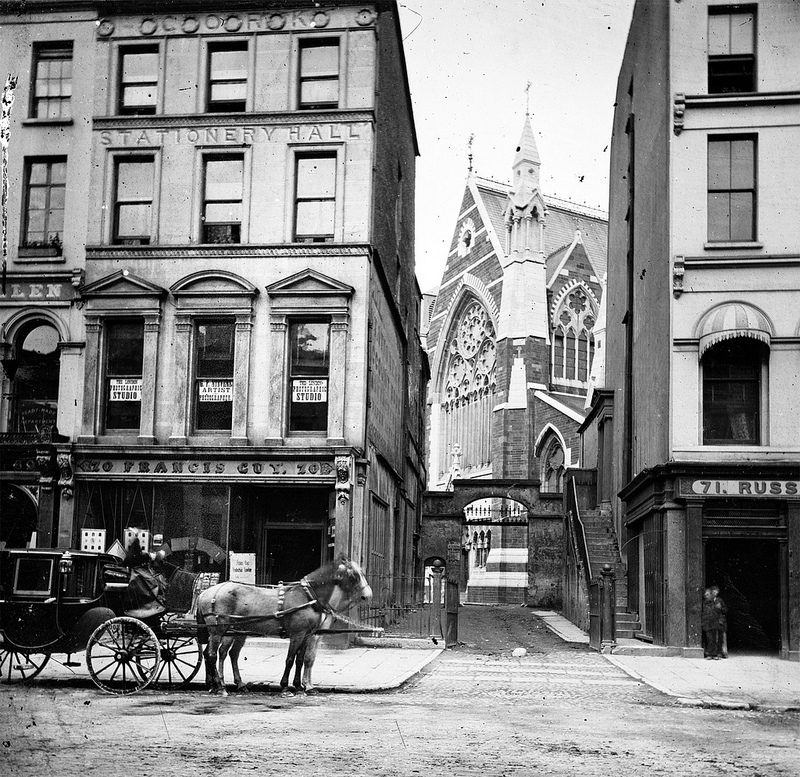 Guy’s business (so-called “Stationary Hall”) on 70 Patrick Street, ca 1867. Small portraits can been seen hanging in the front window. It’s unknown when the Berlin Photographic Studio operated at No. 33, but from 1884 onward it was run by R. Williamson & Co. Like Francis Guy, Richard Williamson began with a different trade. As a letterpress printer, he circulated books and other periodicals at No. 61. The building later became the primary home for Berlin Studio and like Guy’s business, its address was proudly engraved on hundreds of cabinet cards. 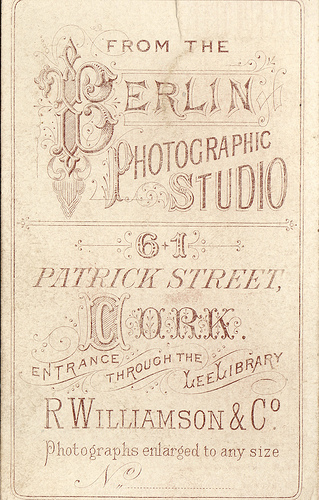 Backmark for a Berlin Photographic Studio card. We will never find the answer to all of our questions. Like, when did my ancestors walk into the photographic studios to meet with Guy and Williamson? How are they even related to me? But it begins with questioning what we don’t know in the first place. Once we do that, we can discover a wealth of contextual information and at the very least, make conclusions about what that day in Cork probably was like. If we do not, heritage only becomes a holiday known only for green beer, shamrocks, and four-leaf clovers. Guy first appears in Laing’s Cork Mercantile Directory working as an independent stationer in 1863. Before then, he managed a shop at 94 Old George’s Street in the 1856 Slater’s Directory. Francis Guy, Francis Guy’s City and County Cork Almanac and Directory for 1884, in the Cork Past and Present.ie, accessed March 17, 2014, http://www.corkpastandpresent.ie/places/streetandtradedirectories/. Francis Guy, Francis Guy’s City and County Cork Almanac and Directory for 1884.